Soak the poppy seeds in 1 cup milk for 2-3 hours. Then grind it in grinder and make a smooth paste. Then make a paste of dates by grinding it. Take a bowl and allow to heat it,add ghee in this. Then add poppy seed paste and dates paste in this,fry them on medium flame for 5 min. Now add milk in this mixture and add sugar. Allow to boil up to it become a thick. Now add cardamom powder and remove from flame. Garnish with cashew and almond, and serve it. Poppy Seed is Khs khas in Hindi. Thanks Aarti. 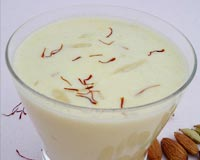 hi aarti, ur recipe is simply delicious & really different. i never ate such a nice kheer. plz keep uploading different recipes.